Zdrava, During our stay in Bosnia & Herzegovina last May, we decided that we should visit Mostar for its historical and political interest. Mostar is also a UNESCO world heritage site. Mostar is named after the bridge-keepers (mostari) who looked after the bridge which joins two communities, We were staying in Sarajevo and the train to Mostar was due to leave at a rather ungodly 07.10, so we needed to leave our hostel about 6.15 am to ensure we caught an early tram from outside the library building. The day turned out to be bright and sunny, but as Sarajevo is among the mountains, it was still cold. A tram turned up in good time and although we had sufficient time to buy a coffee and breakfast, there was nowhere open, except one place where we had to be satisfied with a cold coffee. The train passed through magnificent mountain scenery, the train journey ended in Konjiv (like in England, there are weekend engineer workings here too) Our journey then continued by motor-coach to Mostar station, a rather unglamorous building (Autobuska stanica), and a fair walk from what we expected to see. A walk towards the centre was well rewarded when we arrived at the famous site of the bridge (Stary Most), which symbolically is more than a simple bridge. The bridge is a link across the Neretva river and links the former Carsija (pronounce Charshiya) to the mahala areas (ie the craft/commercial centre to the residential area). As we approached the bridge we passed through the Carsija, which comprised of narrow streets, containing craft and souvenir shops. 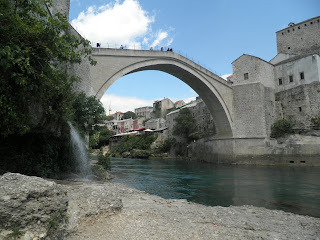 The bridge itself is very steep and is only open to pedestrians, and by the "kapia" there is a visitor centre, showing films of Mostar under siege in the 1990's Yugoslavian wars, when the bridge was destroyed. 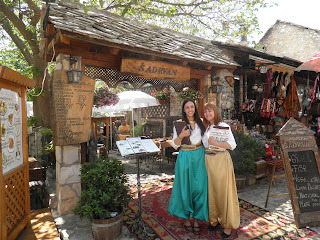 On the other side of the bridge (the Mahala area) we soon found restaurants, bars and cafes and settled for our lunch at the Restaurant Sadrvan (pronounced Shadrvan) where the waitresses (dressed in national costume) greeted us from the gateway. The restaurant served traditional Herzegovinan food, we had Mostarski Sahan (small sausages, stuffed onion in cabbage leaves) local beer and dessert. See photo below. After lunch we continued to walk and explore the Mahala, crossing other bridges, and seeing an interesting golden colour building and Roman Catholic cathedral. We also spent some time sitting under the Stari Most, enjoying the sunshine, and then returned to the station in good time to catch our (now) coach. We still had some time to have a beer, coffee and local cheeseburger and chips. However the wait for the coach to Konjiv proved longer and by the time (about 1 1/2 hours late) the passengers were impatient and those behind us were pushing as we boarded the bus. The wait was caused by the need of a 2nd bus. By the time we arrived back into Konjiv, it was too dark to enjoy the scenery, and we eventually arrived Sarajevo 22.15, the tram stop outside the station looked like it wasn't going to see a tram again that evening and we eventually caught one from the main street.